the significant solar eclipse on 20th March. Followed by an after dark observing session if weather permits. where all but a tiny sliver of the Sun will be hidden by the disc of the Moon. Location(s) to be confirmed - check CAG website. knowledge needed. Please bring a torch and binoculars if you have them. chance for hands on use of a variety of optical instruments. possibly some of the critters that appear as darkness falls. biggest questions that astronomers might be tackling in 2020 & beyond. look for signs of intelligent life. Followed by an observing session if the weather permits. Learn about the interesting objects in the constellation of Orion. 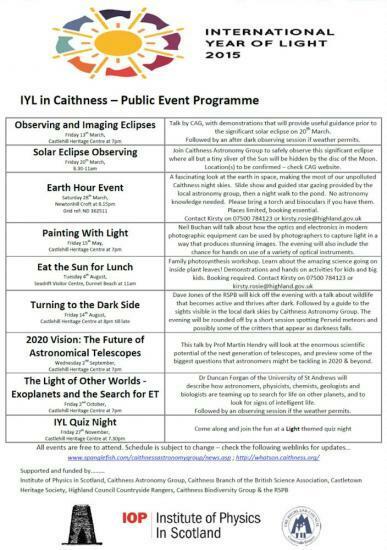 20th February 2015 7.00pm Castlehill Heritage Centre..